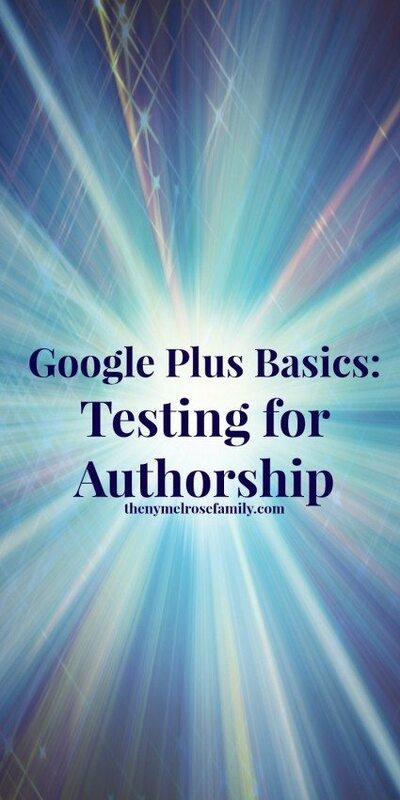 So far we have talked about Maximizing Your Profile and Why You NEED to Get on G+ in the Google Plus Basics Series. Be sure to check out the other video tutorials and subscribe to my YouTube channel. Today we’re going to check out how to test for authorship to make sure that you’re getting the credit for your content across the internet. This is key when you’re looking to come up higher in search. As of August 2014 Google has done away with Authorship. Consequently, this step is no longer necessary. This just makes using Google+ that much easier. It makes it less “techy” and easier for the everyday user to use it while gaining the benefits of “search your world”. Authorship is something that you need to establish. If you have not gone through the process, I highly recommend establishing authorship. I am in no way shape or form an expert in circumventing any issues that you may run into when establishing authorship. The process is different depending upon your platform and the plug-ins that you may or may not use. This tutorial will walk you through how to test authorship once it is set up. It will not show you how to set it up, but it will give you resources on how to set it up. 1. Google Rich Snippet Testing Tool or go to it here. 2. Copy and paste the url of one of your articles. Make sure it is a specific article. You do not want to just take your home page address. There are certain people that you can count on to help with any questions that you might have about establishing authorship. Mark Traphagen is one of them. He not only has numerous articles out there about Google+, he also runs the Google Authorship and Author Rank Community on Google+. I used his article How to Show your photo in Google Search Results to establish my authorship. In this article he also talks about establishing authorship for a site that has more than one author. Authorship can only be set up with your personal profile. Publisher markup is meant for a brand page on Google+. Authorship provides a way to give you credit for all of your content across the web. In other words, if you are a regular contributor to a site other than your own, you are going to get credit for that content. This is Google’s way of determining what you are influential in. Many people thought that their authorship was not established if their picture was not showing in search. This is no longer true. With the recent reductions made by Google to authorship results in search, which you can read all about here. The pictures of the authors are limited so if you are not seeing your picture, it does not mean that you do not have authorship. Make sure to check the testing tool! Great post (as usual) Jenny.. Here’s a question: if a person guest posts on another person’s blog, is there a way to include that post in your own authorship? Thanks so much Libby. Once your authorship is set up, it will allow Google to track your articles. You would just need to have the site that you contribute to to add your G+ profile within their wp settings. Your authorship is tied to your profile so once that’s set up, you should be good to go. This is such a great post Jenny! Something has happened to my site over the last few weeks and my search results have literally tanked, I am losing keywords somehow…anyway, I started thinking maybe I lost authorship somehow but just did a test to check, and all is ok there!! Thanks so much for sharing this! Thanks for the post – I notice when I google something of mine my photo shows up next to the link but other people have a photo of the recipe. Is one better than another? Unfortunately, Google recently made some reductions to showing profiles pictures and recipes. Even people with authorship are losing their pictures as the reductions are made.